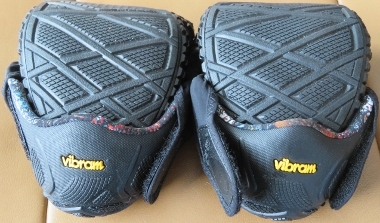 The Vibram Furoshiki Shoes arrived in the requested size of 43 EU (9.95 US) and the color of black. I assume the shoes I received are the Men's version as the Women's version are only available up to 42 EU (10-10.5 US). I ordinarily wear a Women's size 43 (11 US). There is no visible difference that I can tell between the two versions in the color of black. The shoes were folded and encased in a small nylon drawstring bag for storage. 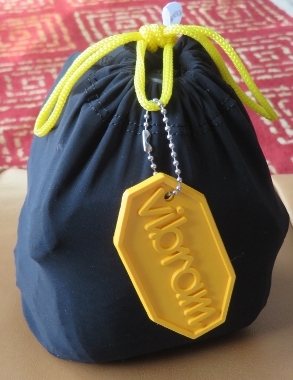 There is a key chain attached to the bag with the word "Vibram" on it. Two small tags noted that the fabrics were made in Italy, and that the product had extra comfort, breathability, were wrinkle free and easy care. No imperfections were found on the product. The Furoshiki are unlike anything I have ever worn on my feet in the past. They kind of remind me of a ballet slipper with more features. The top of the minimalist shoe is made of stretch nylon and has an adjustable fit via two nylon fabric wraps that fasten with hook-and-loop closures to either side. The wraps cross the foot twice in opposite directions in a diagonal pattern. Furoshiki refers to a Japanese folding technique and are the shoes' namesake. The soles of the Furoshiki Shoes are made out of Vibram and appear to have nice traction or tread. The sole does wrap up on the sides of each shoe especially on the toe and heel areas. The sole heel wrap actually forms the shape of the heel. The inside of the shoes feature a cushioned non-removable footbed. It has a neat design pattern on it. To wear the shoes, I first slipped each foot into the toe area and then placed my heels on the footbeds. At this point I wrapped and closed one side and then repeated with the other on each shoe. This closure can be adjusted for comfort and support. As aforementioned I assume that I am testing the Men's version and I have no trouble with fit (the manufacturer does note that a Men's and Women's shoe in the same European size would have a slight difference in length and width). In my opinion, with the adjustments on the shoes being flexible they can fit a variety of foot shapes and widths. The shoes have a 6-weeks return policy with no questions asked. There is also a 90-day return policy for new or defective footwear. Care instructions are located on the website. The Furoshikis should be hand or machine washed (gentle cycle) only in cold water with detergent. They should be air dried. The manufacturer warns to never use hot water or dryer machines as it will likely result in the "demise" of the shoes. If the shoes are worn in a pool or ocean; they should be rinsed off. No worries there! 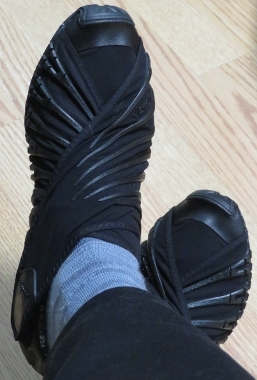 The Vibram Furoshiki Shoes appear to be a nice comfortable minimalist pair of shoes that are easy to place on and off my feet. The small storage bag makes them very packable. 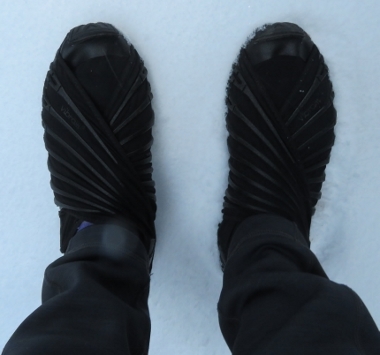 During field testing I have worn the Furoshiki shoes during many trips for skiing and other recreation. The forests included boreal and deciduous settings, mountains and lakeshore. Elevation ranged from above 600 ft (180 m) to over 7,000 ft (2100 m). Trips included those in Michigan, Wisconsin and Arizona, USA. I also traveled to Ontario, Canada. During the field test period I have worn the Furoshikis mostly inside but I have also used them outside as described below. Testing occurred during the winter season so the temps were from well below zero (-18 F to 40 F/ -28 C to 4 C). 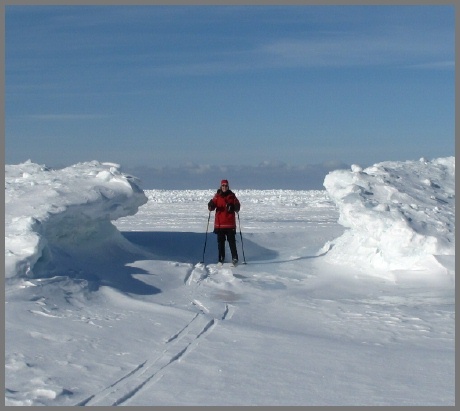 As soon as I received the Furoshikis I was off on a three-night/four-day cross-country ski trip. I stayed in a rambling very old historic house that doesn't have the greatest heat. The floors were wood. The outside temps were double-digit below zero F and it didn't warm up that much during the day. I wore the Furoshikis inside the house during the hours when I wasn't skiing or sleeping. I wore a light pair of wool socks with them and my feet were very comfortable. This was actually unexpected as I always have trouble staying warm after being out in bitter cold for many hours. During another winter trip I pulled a gear sled into a rustic cabin where I stay for three nights. I wore the shoes again anytime I wasn't skiing or sleeping. That included frequent trips outside to the wood pile and outhouse all hours of day and night. The paths to those two locations always gets slippery due to impact on the snow, but I always felt that I had great grip to handle the icy surfaces. My next trip away from home was to a cross-country ski resort in Canada. My friends and I stayed in one of the many auxiliary chalets so we walked outside to the clubhouse and main lodge where we had breakfast and dinner. Although the distances weren't long there was a lot of fresh snow each day so I was essentially walking in snow over my ankles. My feet didn't seem to mind and in fact I don't think they got more than damp. My last trip was to Arizona. The temps varied from 85 F (29 C) in Phoenix to below freezing and snow at Flagstaff and the Grand Canyon. I wore the shoes both inside and outside. In Scottsdale, Arizona the house I was staying at had all tile floors and a large pool surrounded by lots of brick and concrete and rocks. I was able to wear the shoes consistently through that part of my stay (first five days). I then traveled to other parts of the state where surfaces varied from dirt to rock to snow. Did a lot of hiking but just short distances in the Furoshikis. I have also traveled to Wisconsin three times in the last two months to visit my grandkids. It is about a five-hour drive and I have worn the shoes for driving with good results. Everywhere I go people are curious about my shoes. I feel like I am a walking advertisement. Many indicated a desire to buy them so it will be interesting to see if they do. I think the feature that most people were interested in is the adjust-ability to fit different widths of feet as so many people have trouble finding a shoe to fit them. All winter long I have skied regularly (87 times so far to be exact). I have worn the Furoshikis on many of these trips to and from the trailhead. The ground was almost always snow or ice covered until lately. I am still skiing but roads and parking lots are now bare except for an occasional period of snow a few times a week. Because I ski so much I spend a fair amount of time waxing my skis in my basement. The floors are concrete so I need to keep my feet warm as well as having some support. They have worked well for those endeavors. The shoes certainly have been easy to pack for all of my trips. I usually just fold them in half and skip the storage bag. I haven't felt the need to clean the Furoshikis yet. As referenced they were worn outside mostly on snow surfaces and a lot of indoor use has kept them clean. So far the Furoshikis have performed well with no sign of failure in a wide variety of conditions. Even though they are not waterproof, I have worn them in snow without adverse effects. The Vibram sole has kept me upright in slippery conditions. Even though the shoes have been given many double-takes by other people, I think they work well as a footwear choice with any kind of clothing. I have even worn them with a dress and tights. In the long term testing period, I am looking forward to taking them as camp shoes on backpacking trips. Thanks to Vibram and BackpackGearTest.org for this opportunity to test the Furoshiki shoes. My final report will be available in about two months.